Do you know the Top 100 Irish Surnames? How about the Top 10? Where do you go to find out? You could check in the census returns – but what we do here at Your Irish Heritage is a little different. Whenever someone signs up for our newsletter, we ask them to provide us with the Irish surnames in their family tree as well as the counties they come from. Some give us one name – some give us up to 30 names! So far, we have collated over 6000 Irish surnames in this way from subscribers in 22 different countries. Here they are – I have put the spelling variants in the left column and the number of times the occured in the right column. As you can see, this is only 100 names – I only included names that occurred at least 10 times. 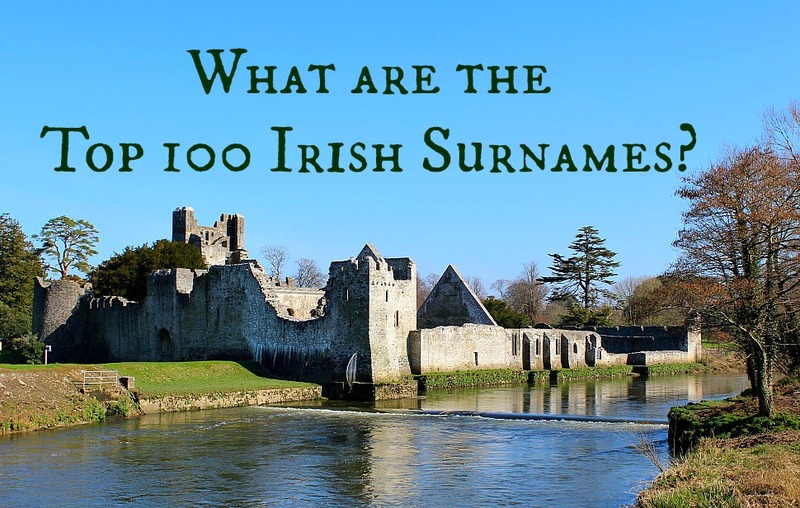 Are your Irish Surnames on our list? where are the top 10? Hi Jeanne – the top 10 are the first 10 names at the top of the list. Mike. Hi Chris – we have 9 O’Tooles on our database. Mike. I noticed that the Farrell surname was on the list. My ancestors actually spelled their last name Ferrell and they have been in the United States since at least early colonial times. My oldest direct ancestor by this name that I’m sure of is William Ferrell who may have been born in Virginia around 1740 or I have also seen County Longford, Ireland. He was killed by Native Americans in an attack on June 15, 1778. I have seen his parents listed as John Ferrell and Ann Fish but I am not sure whether or not this is correct. I spoke to a gentleman a number of years ago and he had told me that his understaning was that the two spellings for this name had come out of a desire to be able to distinguish Protestant and Catholic branches of the family but I don’t know if that is an accurate account or not either. I just wanted to put this information out here since I only saw the one variant of the name listed above. I’d love to make it to Ireland one day to do a little research on this group. Hi Jason – Ferrall/Farrell/Ferrell are all English variants of the Irish “Ó Fearghail” – sometimes the spelling can change due to religion but not all the time. Hope this helps – Mike. I have to surnames for my side and that is Isaac Barton m.Sarah Vassey in 1705 in county Limerick. And then there’s Barton. Thanks for sharing Cynthia – I have now added your surnames to our list. Mike. Where is Parnell in this list??? Hi Sharon – I have no reader submit Parnell – so not on the list! Mike. would joy be shorten name for joyce . It often is in Connaught Ronald. Mike. I don’t see any mention of the Mulrennans of County Roscommon, in my research I found that the Mulrennans were the chieftans of Clan Connor. The Mulrennans were the direct decendents of the 17th King of Connaught King Muireadach Maoilleathan. He ruled from 696 to 702 AD. My great grand mother on my mothers side was Elle Elizabeth Mulrennan, she was the daughter of Dominic Mulrennan and Mary McCarthy both of County Roscommon. It seems we have a double royal line. We also have the Names of Higgins born in Newport in county Mayo and Haley. Great grand father Haley was born in Galway in Mayo. Any additional information you on these family names would be very helpful. Hi Michael – you are absolutely right. This article was an early one. The book contains all the extra names. All the best, Mike. My family, Lordan, comes from West Cork. There’s also Scanlons (Cork? ), Gibbons, Kellys and Paddens (Mayo) in the family. I just found your site and love it. I have always had a desire to go to Ireland. My maiden name was Patterson and I have been told I am Irish and Scottish. How do I find out any information about this. I don’t see anything on Patterson or Barron. I am just starting out on this. Hi Wanda – Patterson in Ireland originally comes from England and is mostly found in the Counties of Ulster. Barron can be Scottish OR Irish Gaelic (either from Tyrone or Waterford/Kilkenny). How does one go about researching an Irish surname? Hi Ann – if you are on the Letter from Ireland, just ask me a question when you receive the letter. If not, you can sign up at http://eepurl.com/xPw4P Mike. My grandma was Bridget Corcoran. Her father was Richard and mother Margaret Doolin. We found her baptismal records in Rosebercon. Hi Deb, names now added to list! Mike. Hi Mary, your names are now added to Mayo. Mike. Hi Mike, this is my first correspondence with you. I am enjoying your weekly newsletters very much. My Mother’s maiden name was Deery. Her grandparents were Francis and Elizabeth Donnelly Deery. Do you know where in Ireland the Deery name originated? Hi Elizabeth – glad you are enjoying the letters. Deery comes from County Derry. Mike. Finn was a popular first name in many parts of Ireland. It means “fair” or “blond”. And so it became a surname in many parts of Ireland including Monaghan, Sligo and Galway. It is also found in Waterford. Beyond that – you may need to hire a genealogist to get any further on records. Glad you enjoy Kathleen – and good luck with your Haverty search. Names added to list. Mike. Here are some names for you: Sweeney, Coleman, Fee, Whalen, Walsh, Downing, Murphy, O’Brien, Flanagan, Conlon, Dunn, Welch & Cunningham. Names added to list Claire. Mike. First time to your site. I have been trying to track Irish relatives on my Father’s side through Ancestry.com and immigration records but, without much luck. My grandmother’s name was Delia Flannery born in 1879 in County Clare, I believe, Her parents were Dan Flannery & Ellen Brogan. She immigrated in 1898. She died in 1941, before I was born. I have not had much luck with my grandfather; his name was James J. Minogue. He immigrated from Nenagh but, I don’t know if that was actually his birth home. I think he arrived in New York in 1903 on the Majestic from Queenstown on May 21, 1903. I am not even positive if these records are for the right James and I don’t know his parents. He died in 1958 at age 80. My Dad was the last of the family and he died in 1991. Sad to say, none of the family was ever very close so I don’t know much! I also have heard that some relatives are in Australia, even one lady has a park named for her! Not sure if she was Minogue or Flannery. Any information would be gratefully appreciated, Good Luck. My grandfather was a McDonough from Galway and my grandmother was a Walsh from Belfast. My maiden name isn’t here…….McEnaney, nor is my married name Monahan (Monaghan) Husbands grandfather dropped the “g”. My maiden name is Howe. Is it 0’Howe or just Howe. My grandfather was born in Ireland. ( as was my grandmother). need to know if the name Toy was in any way Irish? My Maiden Name is Sheen & apparently we are from the line of King Brian Boruma/Boru… And from the Dal g’Cais Sept.. From around Limerick & Cork or Munster Sligo etc.. Our Coat of Arms is a White Dove with an Olive Branch in its beak.. Azure Blue with Verdan green & held a Seat at Bunratty Castle in County Clare..
Brown is my family’s surname from my dad’s side, but my mom’s side is Herring and Ricks. I’ve always been told that these were Irish as well, but have never seen them in any search. Are they Irish in origin? Gee, always thought we were Irish considering all the pubs with our surname my parents saw when they went there. Maybe not. i have two, Kelley and Greene . How many Thomas Moore’s are highlighted on your above list of Moore surnames??? I have been told that my Brady line came from northern Ireland, but I am not sure of that. The oldest Brady I can find, Joseph J. Brady was born in Murfreesboro, Tennessee in 1821 and from there they went to Farmington, MO. Since you say the Bradys originated in County Clare, how do I connect the two? Hi Mike…Thanks for the list….I don’t expect my Grandmothers name to be on the Top list…but shes a McCarry from Clonbara,near Falcarragh (don’t mind the spelling) Donegal…….beside the owner of a local bar..I never seem to come across this name…or maybe its more common than I think due to my limited access,,,just commenting..your plate looks full enough!!! Thanks Sandra and so happy you are finding The letter from Ireland informative. We’re the Daugherty’s from New Mexico, USA. Originally from Donegal, Inishowen, our family emigrated in 1744. O’doherty and O’Dochartaigh families dating to Shan Carrick O’Dochartaigh of Carrickburghy Castle, and further to Corneliul o”Dochartaigh 1440-1520 of Tyrconnell. Amazing history of a wonderful people. Thanks for sharing your proud Irish history and heritage with us Katy!